The Samsung Galaxy Chat just became official, a couple of days after we saw it in a leaked image. 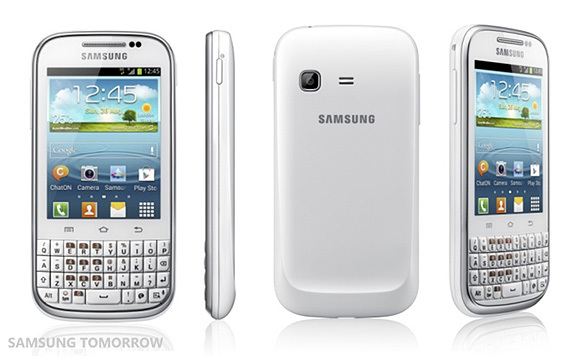 The QWERTY candybar phone will run Android 4.0 Ice Cream Sandwich out of the box with Sammy's traditional TouchWiz skin. The Samsung Galaxy Chat measures 118.9 x 59.3 x 117mm and weighs 112g. Its touchscreen LCD is 3" big and has QVGA resolution (a low 133ppi pixel density) and there's a four-row hardware QWERTY underneath. Other features include a 2MP camera, 4GB of built-in storage and a slot for a microSD card, USB 2.0, Wi-Fi b/g/n and Bluetooth 3.0. The Galaxy Chat will come with Quick Office editor and S Planner apps preinstalled. The Samsung Galaxy Chat will launch this month in Spain first and will gradually be made available in other markets: Europe, Latin America, Middle East, China, Southeast Asia, and Southwest Asia. It will be sold at "a competitive price point".